Fortunately, technology can improve these circumstances. It is by no means a silver bullet. But it can go a long way toward helping teachers tackle the challenges on their plates. When we consider the long march of progress across human history, our common story is interwoven with advances in technology. From the wheel, to the steam engine, to the supercomputer, technologies expand what people are capable of producing. Food, clothing, housing, energy, and entertainment are all far more affordable and accessible than they were just a few generations ago because technology has steadily pushed out the frontier of human productivity. As illustrated in the diagram below, technology can play a similar role in our education system. Edtech can help teachers use their time, attention, and energy in new ways to make a bigger difference for their students. To help advance dialogue and thinking on this topic, I’ve been working on a framework for categorizing the various ways technology can expand educator capacity. Although edtech is a common feature in most classrooms today, I suspect most schools are only skimming the surface when it comes to using technology to burst past time and human resource constraints. In most classrooms, technology serves primarily as an instructional resource for enhancing teachers’ lesson and assignments. But the greatest benefits of edtech, I would argue, come from saving teachers’ time and enabling new instructional models. My hope is that this framework helps educators see new possibilities for harnessing edtech’s full potential for teaching and learning. The framework identifies three potential ways technology can amplify educators. First, technology can enhance teachers’ effectiveness. For example, a chalkboard enhances how teachers convey information by allowing them to complement their verbal explanations with visual representations. Similarly, high-quality curriculum enhances teachers’ lesson plans by directing them to effective teaching methods. As a more recent example, IBM Teacher Advisor helps teachers find high-quality lesson materials tailored to their students’ learning needs. Second, technology can accelerate how teachers get their work done. Acceleration comes in two forms. In one vein, technologies accelerate teachers’ work by helping them do that work more efficiently. For example, Google Classroom can help teachers hand out, collect, and grade assignments in less time than it takes to do those same activities by hand. In the other vein, technology can completely automate tasks so that teachers can take those tasks off their plates. For example, teachers use software like Khan Academy or iReady to automate some of the work of explaining concepts, serving up practice problems, and providing feedback. Third, technology can enable teachers to use new approaches in their work that were impossible or impractical previously. For example, technologies like Lexia Core 5 enable teachers to take daily snapshots of students’ learning and give students targeted instruction in ways that are almost unfeasible for a teacher to do manually at scale on a daily basis. 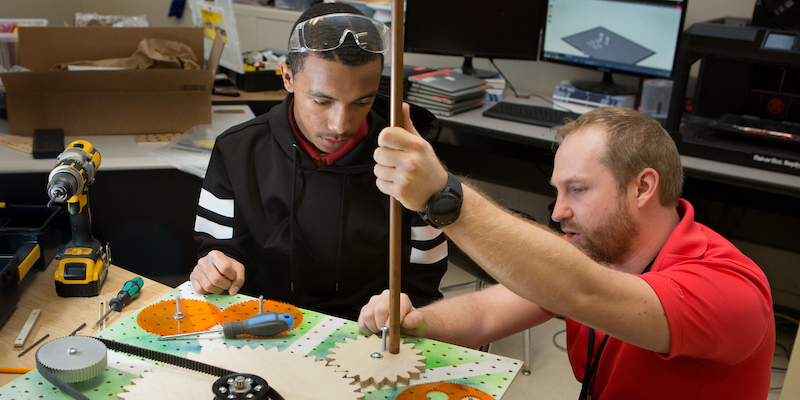 Similarly, technologies designed to foster students’ social capital give teachers a way to connect students with mentors, tutors, and advisors—work that is otherwise too time-consuming to coordinate. Importantly, some technologies “enable” indirectly through “acceleration.” When technology can cut back the time teachers have to spend on one type of activity, it frees up teachers’ time for other valuable activities. For example, when technologies for writing instruction, such as ecree or NoRedInk, provide automated feedback on the grammar and structure of students’ essays, teachers can focus more of their feedback to students on other important elements of quality writing, such as reasoning, rhetoric, and style. Similarly, math instructional technologies like Khan Academy give teachers a manageable way to implement mastery-based instruction, a strategy that is hard to coordinate at scale otherwise. Enhance Improve teachers’ effectiveness at carrying out various tasks - Chalkboards let teachers complement oral explanations with visual representations. - Quality curriculum helps teachers plan better lessons. - Multimedia technology allows teachers to present content in more engaging and memorable ways. Accelerate Improve teachers’ efficiency in completing tasks, either through streamlining or automating those tasks - Quality curriculum helps teachers prepare lessons more quickly. - Essay grading software automates some aspects of essay grading and feedback. Enable Make it possible for teachers to carry out activities that are otherwise impossible or impractical - Adaptive learning technologies make it possible to offer a high degree of differentiated instruction. - Online videos and assessments make it possible for teachers to shift toward mastery-based learning. 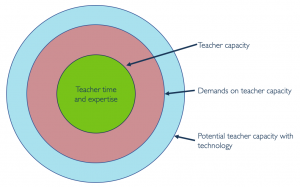 The framework above highlights edtech’s potential benefits. But those benefits are not guarantees. Before we get caught assuming falsely that technology is always a good thing, it’s worth noting a few reasons why potential benefits might not bear out in practice. First, some technologies on the market are low-quality. A shiny new tool that doesn’t square with the facts of learning science or the realities of the classroom won’t be able to deliver on its promises. New and sophisticated isn’t synonymous with better. Second, all technologies come with capacity costs. Teachers have to spend time upfront learning how to use new technologies, and then spend time on an ongoing basis managing those technologies. If the benefits of a technology do not outweigh the costs of adoption and implementation, the technology may have a net negative effect on teacher impact. Third, some technology implementations can amplify teacher impact in some areas while simultaneously producing negative side effects in other areas. For example, online learning could amplify a teachers’ impact on students’ acquisition of content knowledge by enabling mastery-based learning, but also diminish the social aspects of learning by relegating students to isolated screen time. I emphasize these points to make clear that technology’s supposed benefits do not always bear out in practice. When considering any particular technology, educators need to be thoughtful about whether actual benefits outweigh potential drawbacks. As educators consider the onslaught of various educational technologies on the market, they can use this framework to see beyond advertised features and functionalities and consider how those technologies expand teacher capacity. Do those technologies enhance teachers’ current approaches? Do they give teacher more time by accelerating some of the tasks on their plates? Or do they enable new activities and instructional models that are otherwise impossible to implement at scale? Please share your thoughts and feedback in the comments below or by contacting me via Twitter (@ArnettTom) or email ([email protected]). A few important recognitions are in order. First, the SAMR model and the RAT framework are two sources I studied while developing my framework. Although I believe the focus and purpose of my framework is distinct from these other categorization schemes, they have undoubtedly influenced my thinking. Second, Steve Peha’s recent comments shared on Rick Hess’ blog were a major influence on my thinking for this project. Finally, I’d like to thank Sanjul Bhakri for being a fantastic thought-partner in this work.